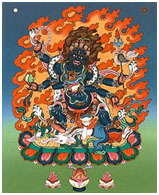 Mahakala is a Dharmapala, a protector of religious law. He is always depicted as an extremely fierce and terrifying deity. His purpose is to help in overcoming negative obstacles on the path to enlightenment. A compassionate wrathful deity, he appears evil, like a demon, but functions more like guard dog, or guardian angel. (Sergeant) His aggression is necessary,for it allows him to demolish obstacles and negativities one faces on the path to enlightenment. Mahakala is depicted in a variety of different ways, sometimes with six arms, other times with two. He is often brown skinned and associated in tankas with Penden Lhamo.